It was 2002 in a small cafe, in a town in the south of Germany. That’s when it happened. I had my first caipirinha. 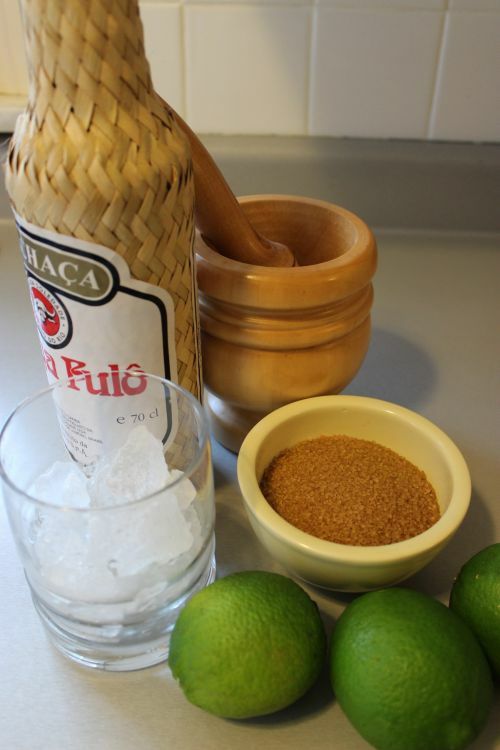 A sweet Brazilian cocktail, made from raw sugar, limes and cachaça. Shortly, after that I had my second. Somewhere between 5 to 6 Caipirinhas later, at approximately 4 in the morning, wandering through the streets of Göppingen, I realized that Caipirinha and I would BFFs forever. It also didn’t take me long to realize that plenty of others had discovered its intoxicating taste and nearly every restaurant in Germany and across Europe offered up Caipirinhas. Every country has a spirit or liquor they call their own. Mexico has Tequila, Chile has Pisco, Italy has Grappa, Russia-Vodka and so on. Brazil has cachaça (pronounced ka-SHASSa). With it you make Caipirinhas (we called them caipis for short, makes it easier to pronounce after you’ve had a few), the national cocktail of Brazil and a great way to consume cachaça. Back in Windsor, of course, no one really knew what the heck a Caipirinha (which means “little peasant girl”) or cachaça was. A caipa-what? While in Belle River, one day, I stopped by the local LCBO and asked if they carried cachaça. The lovely woman behind the counter had never heard of it so I explained to her that it was used to make a sweet Brazilian concoction. She smiled, cocked her head slightly and said “You’re not from around here, are you?” I actually had to think about this because for a split second she made me think I really wasn’t from around here. After searching nearly every liquor store in the region, I realized that I would have to do without. So each year in my sojourns to Europe, I make sure to stock up on cachaça. I’ve got a secret stash of the stuff and dole it out as if it was the last bottle on earth. Distilled from sugar cane juice, cachaça was a favourite brew of workers on sugar plantations in the 1600s. Over the centuries, it’s become so popular that in 2007 Brazilians consumed over 1.5 billion litres of the stuff making it one of the five most consumed spirits in the world. That’s a lot of drinkin’. Making Caipirinhas is easy. I had a bottle of cachaca that I brought back with me from Italy. Sean has been hearing me talk about this elixir for a while now, so it was time to let him try it out. Take 1 lime and cut into wedges. Throw into a flat bottomed, round glass or use a mortar and pestle. Add raw or organic sugar. You could also use fine sugar. Muddle the lime and sugar just enough to release the juices. Add the lime, sugar and some ice into a flat bottomed glass . Pour 2 oz of cachaça into the glass and stir. You could also throw it all into a cocktail shaker, give it a few good shakes, pour back into the glass. Drink. It’s like heaven in a glass. Too much of one ingredient and the balance of flavours shift so it’s taken me a few tries to get it just right. Not for the faint of heart, either. It’s strong. While the lime juice cuts into the spirit and the sugar sweetens it up, it’s still a hefty dose of hard liquor. Sean has a hard time figuring out how I, a person who rarely drinks and has a dislike for most liquors, can knock back the hard stuff like it’s nobody’s business and still manage to get up and walk (I’ll tell you about my love affair with tequila another day). As for Sean, he might not be able to pronounce it (Capero? Cappyrona? Capitano?) but he sure can drink it. 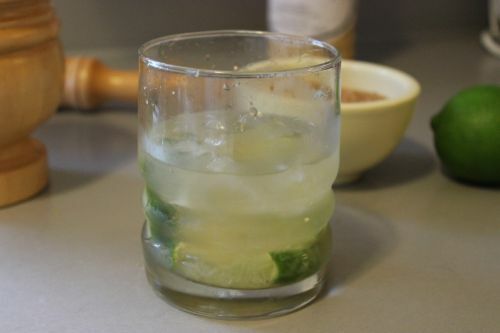 While you might not be able to get a bottle of cachaça in Essex County you can still whip up a pretty good Caipirinha. 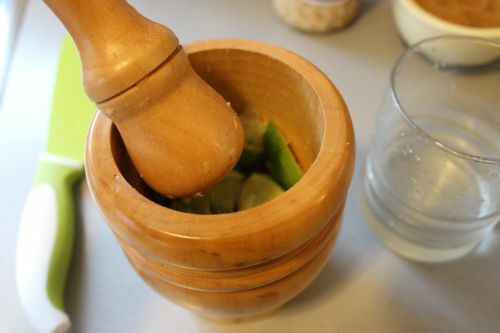 If you don’t happen to have cachaça on hand, just substitute with vodka for a caipiroska or rum for a caipirissima. Either way, I love this drink.